Before building a house, you have to have a sketch, a blueprint. It serves as a proposed plan for the structure you're going to make. The same goes when making a website. Before writing a website copy, you have to envision the anatomy of the site for it to rank higher and pass more link juice between the pages. In the SEO world, this plan is called internal link silos. Well, you can have all of the authoritative links in the world and a seemingly good ranking, regardless of the mess that your website may be. However, if your competitors use the same principle and have a smarter internal link structure, going up the SERP ladder will be harder than pushing the Sisyphus' boulder up a hill. The dictionary explanation for silo is a system, process, department, etc. that operates in isolation from others. In other words, it means categorising and grouping your content and links within a website to clarify the information that the web spiders or crawlers are going to inspect. The result, in short, is either going up the results pages or getting lost somewhere in between 25th and 27th page and falling. Organisational Silo – A plan by which you organise the content on the website. We can describe this one with Bruce Clay's jar of marbles. If we move the content into separately classified jars, the same content will end up in the same jar, but the search engines will know their relevancy, regardless of the marbles being in one single jar. 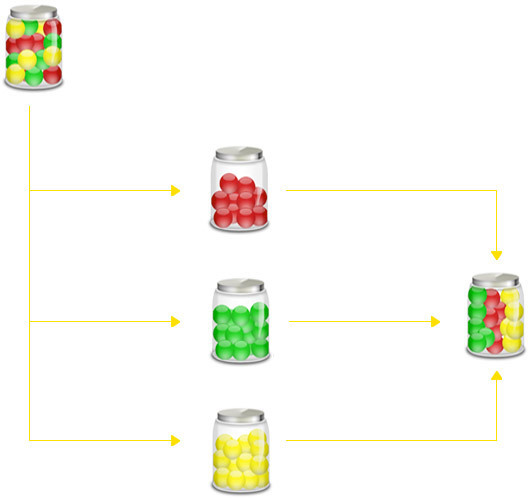 Link Silo – Inter-linking of the website's content to help distribute the link juice up and down the silos. Since links are the main crawling metric between pages on a website, they can be an effective ranking tactic. Not only does a good internal link silos give ranking power to a ​certain website, but builds trust and authority compared to the sites where making a silo comes as an afterthought. Aside from the technical aspect of creating an internal link silos, there's human factor involved. Most of the visitors will exit the site if the pages are poorly categorised. So, an organised internal linking structure, except for decreasing bounce rates, increases the number of pages viewed per session. Furthermore, higher category pages can get more power with the help of the lower category pages and external links relevant to these categories. Also, if you have many links pointing to a single page, the link juice can work vice versa and not only rank a higher category page, but more different pages. As mentioned, siloing refers to a technique that connects subcategories with higher categories. The given structure makes it easier for the web spiders to crawl through your website without having to analyse numerous cross links. 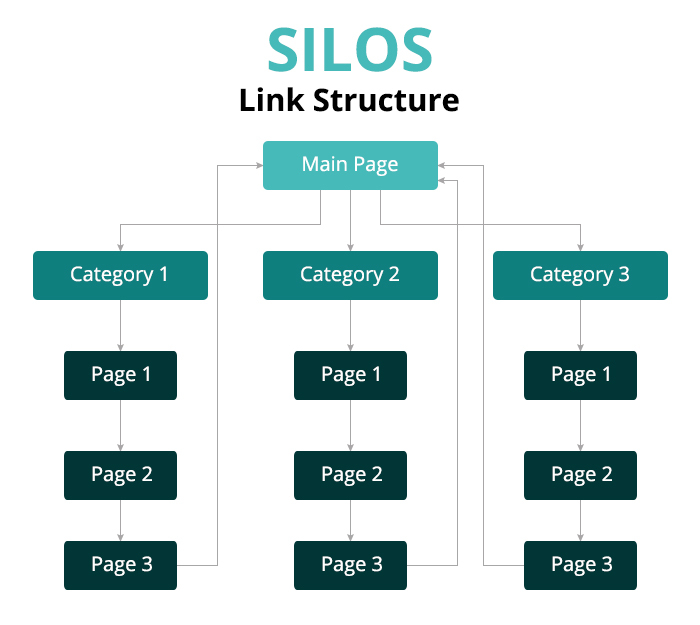 The key advantage of internal link siloing is to make a page with extensive information about a certain subject and then link it with the homepage, as well as with the pages of lower category. To cear things up, let's see the following example. All of the three category pages are keywords and pass the link juice back to the homepage. They automatically gain authority and can even rank without a backlink pointing at them, depending on the competitiveness of each keyword. The internal pages are still connected to the homepage and pass the original link juice from there. The homepage, on the other hand, should rank for the most competitive keyword. As you go down the funnel, your keywords should be less competitive, and they will often rank without a single link. If we presume that the last page of the funnel is Chihuahua Dog Food, adding a link back to the home page ensures the link juice passes through all pages and is never lost. Internal link silos must always be in interaction with other SEO techniques; otherwise, it's useless. For example, doing a keyword research can help you make better silos before organising the links. Lastly, try not to use the same keywords constantly. 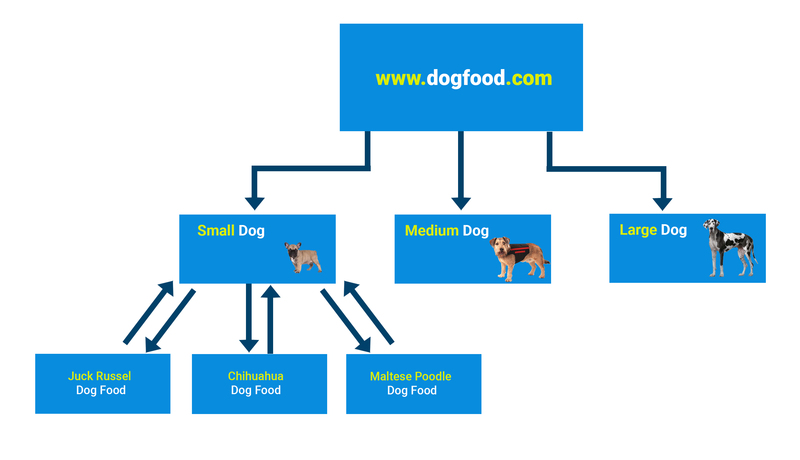 Instead of using Dog Food to link back to the homepage, use Click here to go back to Dog Food homepage. Once you get the hang of building an internal link silos, maintaining a strong structure will be a part of the process rather than an impossible task. Why? Because knowing where to link every new page within that structure creates a strong sitemap and easier understanding from the visitors' and the crawlers' point of view. Ultimately, it leads to powering other pages, higher authority and higher ranking in the search results.